Carolyn specializes in teaching harp to teens and adults of all ages (even in their 80’s). She approaches teaching in a very individual manner, discovering and developing areas of promise unique to each individual. Along with the traditional harp literature and finger exercises, her areas of interest are teaching group lessons, improvisation, music arranging for harp, and performance skills. She enjoys teaches a variety of styles of music including classical, folk, Celtic, pop, religious, new age, and contemplative, and is experienced with alternative approaches such as playing by ear and by rote (imitation). She is a strong believer in developing a relaxed upper body and finger action, plus a solid technique to support a wide range of dynamics and tonal colors. Carolyn regularly offers informal student recitals as an incentive for students to practice and polish their pieces. Carolyn has studied the ergonomics of harp playing and is eager to help those with pain or discomfort to play with ease. To this end she works with students on posture and exercises for releasing, strengthening and stretching areas of the body used in harp playing. Carolyn is encouraging of her adult students who have chosen the harp for recreational music making and also for memory and focus enhancement, creative expression, and general brain stimulation. The program targets high school age and up and, now, beginner through advanced level students, plus teachers of the harp. Also previous attendees have enjoyed returning to review knowledge and skills gained at the workshops. Emphasis will be on movement at the harp—how to better enjoy playing by enhanced finger/hand/ arm/torso movement. Other topics are upper body relaxation and posture, repetitive motion syndrome, finger strength and reaching issues; and general ease of ‘placing by feel’ at the harp. This information is based on current music research regarding the role of the brain in learning and motor movement. And there’ll be improvising at the harp, a skill that trains better listening, concentration, and relaxation—and more confidence--all done in a non-threatening group setting. 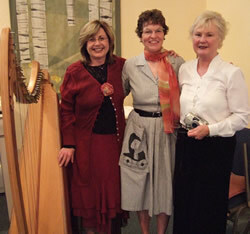 For the past decade, Carolyn has increasingly helped harpists with injury prevention and rehabilitation at the harp. She has formalized her knowledge into a day long workshop called “The Whole Harpist Program”. Harpists of all levels of ability and from various areas of the U.S. have attended these informative and innovative workshops which cover technique, relaxation, ergonomics, and understanding the brain and body connection in regards to the harp. Carolyn has also given workshops locally and regionally on harp improvisation, harp therapy and harp for use in hospice and with the disabled. Carolyn has supervised students to play for hospice and memorial services, directing their attention to the quality and mood of music chosen.